This weekend we traveled down 1-40 to visit with friends and family from west Tennessee area. There isn’t much to see on the straight drive there but there is a Dairy Queen at a regular stop that we like to call “the 108” because we are super creative and it is mile marker 108. See what we did there? 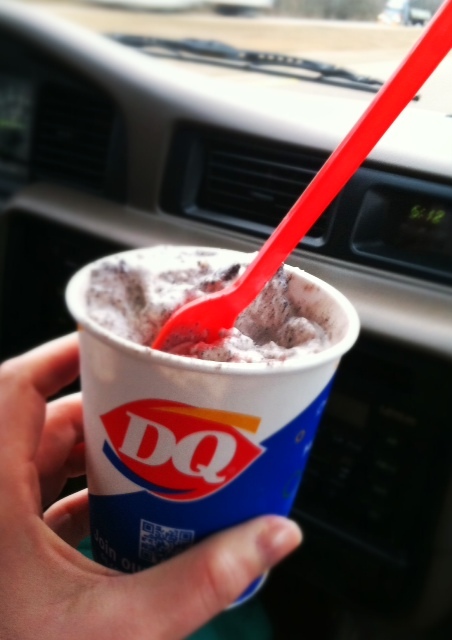 An Oreo blizzard was our selection and we shared it to get us through the last stretch. 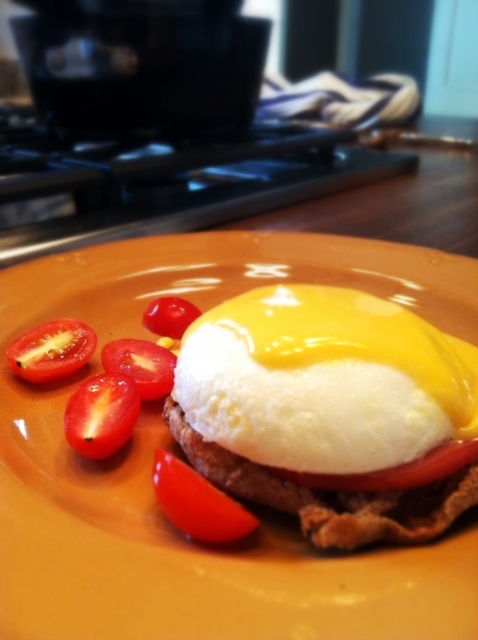 The weekend was filled with yummy breakfasts from our hosts. 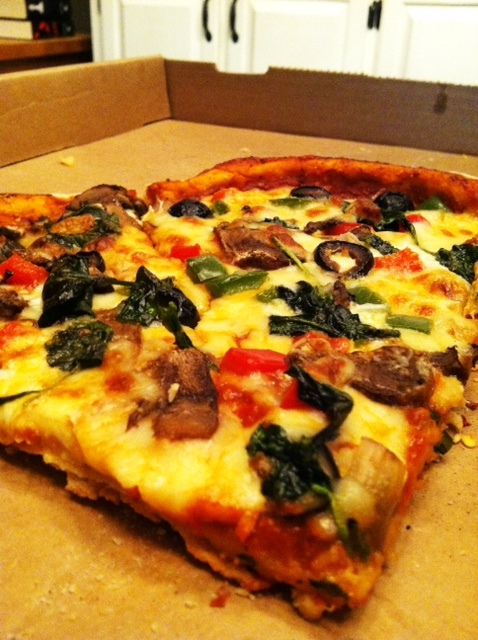 Local veggie pizza on Saturday night from Lucci’s! My dear friend Megan recently had a precious little girl and I spent plenty of time holding her and almost meant every apology I gave about the fact that she wasn’t going to want to go to sleep without being held, when I left. 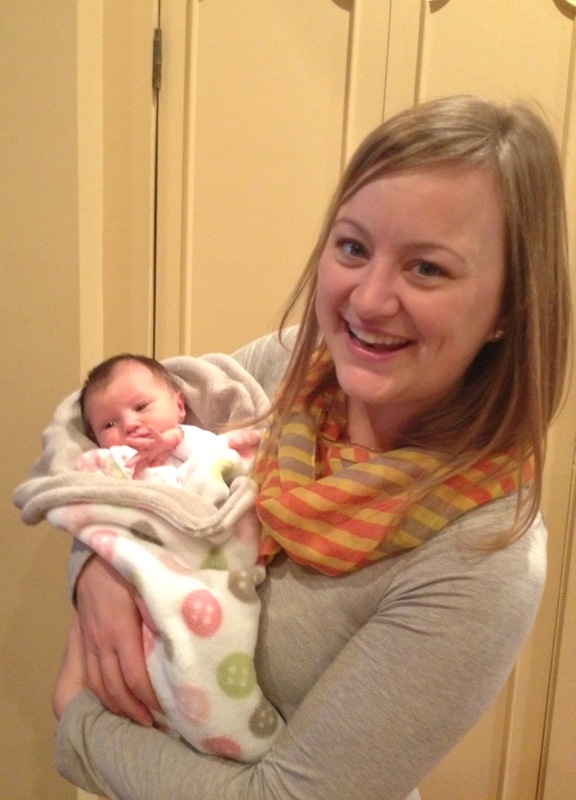 She was too cute to put down and Megan is a great mom already! Friday night on our way down we met up with some friends, Kacy and Jordan, to try out one of their favorite Memphis restaurants, Rizzo’s Diner. Rizzo’s has recently been featured on Diners, Drive Ins and Dives! Because of it’s size, it is more like a hole in the wall. 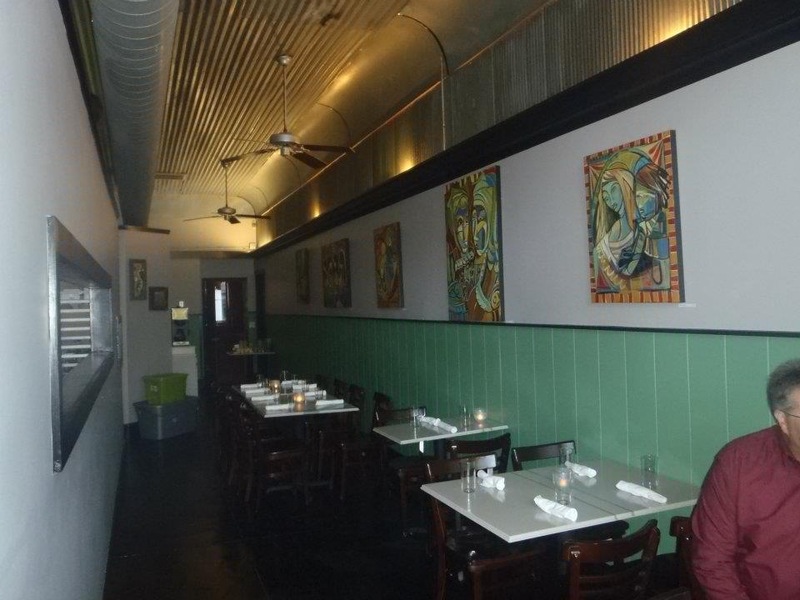 With less than 10 tables, it serves up gourmet fare at a fair price. They also serve up lunch and weekend brunch. The restaurant is mostly BYOB (with a very reasonable corking fee) but they are beginning to bring on wine’s to purchase in case you don’t feel like bringing your own or you just want a glass. You can see straight into the kitchen and we sat right outside of it which was fun. It’s sort of creole/fancy/southern. 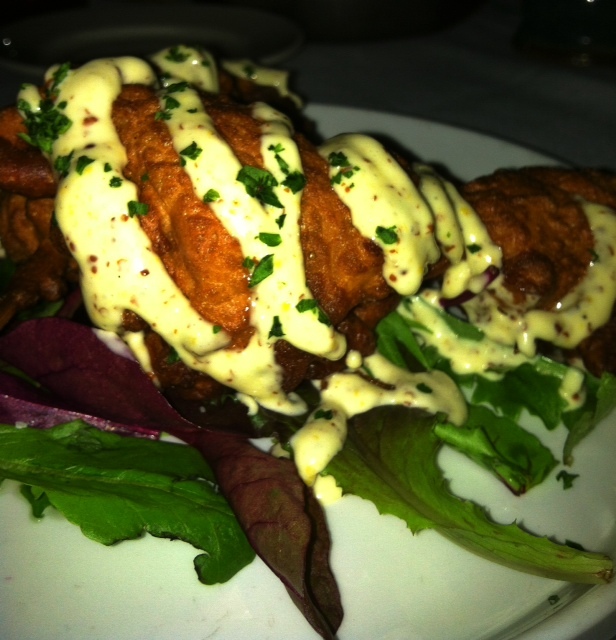 Chef Michael Patrick has an impressive resume, is super friendly and you can tell he loves what he does. This was delicious. First of all, it’s tempura fried lobster. Secondly, it has a dijon aioli that rocks. 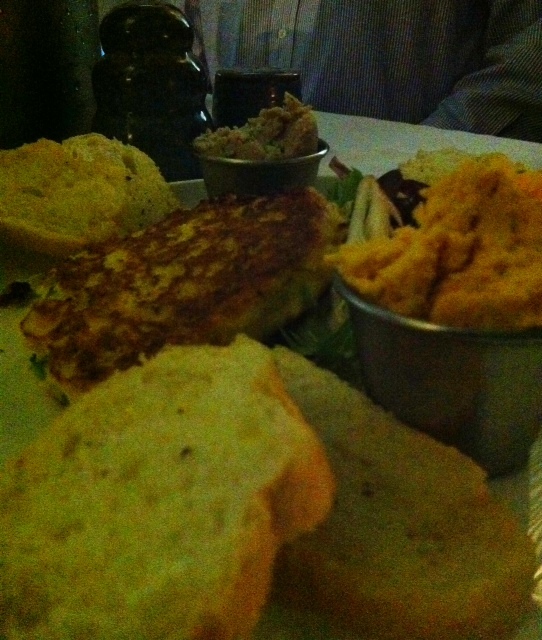 We also had the Vegetable Platter and I can’t say enough good things about their black bean hummus. Yum! 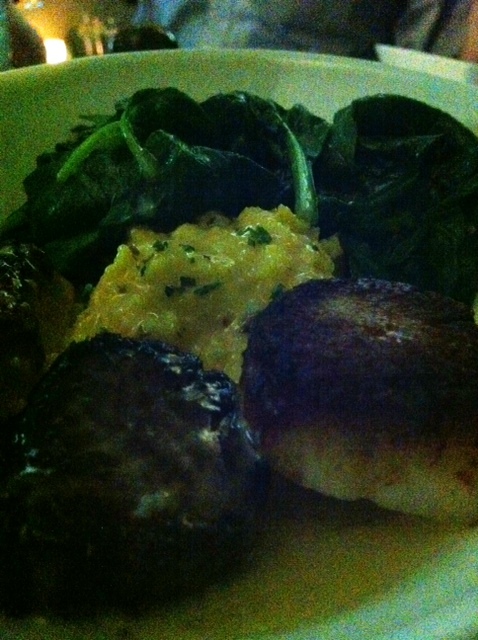 The South Main Salad has a plum vinaigrette and was delicious. 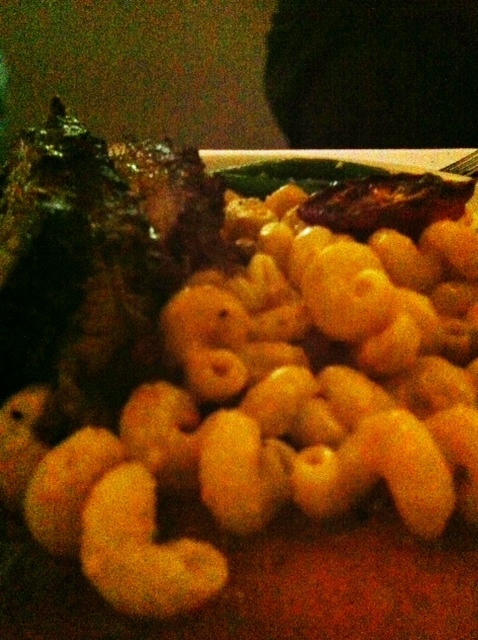 My side kick had Ancho Chili Brisket with a corkscrew mac and cheese. I was so glad this wasn’t served with potatoes! You can’t really see it but trust me. Needless to say there was nothing left on our plates! 8 out of 10 apples for this surprising but humble and inconspicuous spot. 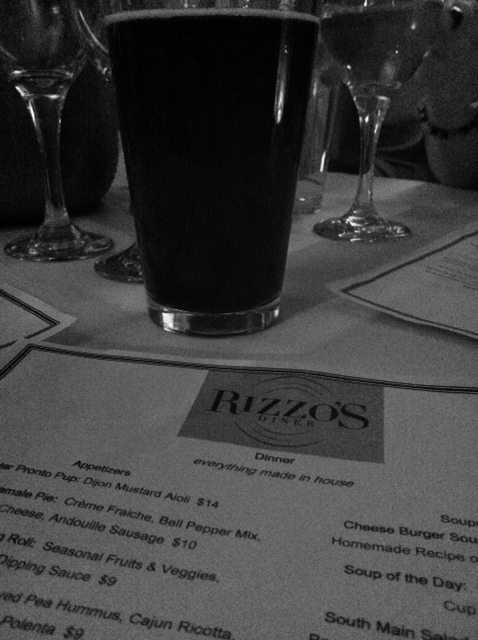 Cheers to Rizzo’s! You look good with that beautiful baby! A natural LOL I love triple D, its one of my favorite shows on the Food Network! It always makes me hungry for whatever he is talking about LOL Hope you are doing good, love reading you blog! !